MOSCOW, Russia -- Russia on Friday accused the West of triggering the Ukrainian crisis by its "megalomania," as fighting continued in Ukraine's east between pro-Russia insurgents and government forces two days before a presidential election. Russian Foreign Minister Sergey Lavrov urged the West to reach a settlement based on mutual interests. "If we sincerely want to help the Ukrainian people overcome this crisis, it's necessary to abandon the notorious zero-sum games, stop encouraging xenophobic and neo-Nazi sentiments and get rid of dangerous megalomania," Lavrov said in a speech at a security conference in Moscow organized by the Russian Defense Ministry. Speaking at the same conference, the head of the General Staff of the Russian military, Gen. Valery Gerasimov, blamed the West for encouraging massive protests that chased Ukraine's pro-Russian president from power in February. Russia annexed Ukraine's region of Crimea in March, triggering the worst crisis in relations with the West since the Cold War. Pro-Russian insurgents also have seized government buildings in eastern Ukraine and fought government troops for more than a month. 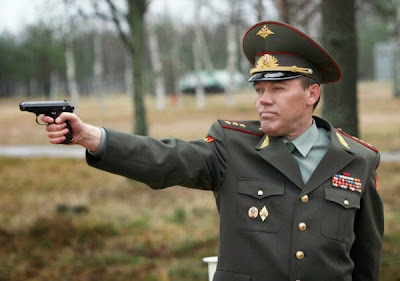 Gerasimov criticized the Ukrainian authorities for using artillery and other heavy weapons against civilians, and charged that radical paramilitary forces and private security companies were spearheading the offensive. Fighting in eastern Ukraine, where pro-Russia insurgents raided a military checkpoint and killed 16 soldiers in the deadliest attack yet, has cast a shadow over the nation's presidential vote set for Sunday. Ukraine's interim government and the West hope that the vote will help stabilize the country, but the authorities in Kiev acknowledged it will be impossible to hold the vote in some areas in the east, where insurgents have declared independence and pledged to derail the vote. Election workers and activists have reported threats and interference from gunmen. Many in the east resent the government in Kiev, seeing it as a group of nationalists bent on repressing Russian speakers in the east. But many in the rebellious regions also have grown increasingly exasperated with the insurgents, whom they blame for putting civilians in the crossfire. The village of Semenovka on the outskirts of Slavyansk, a city which has been the epicenter of clashes for weeks, has seen continuous shelling by the Ukrainian government forces, who have retaliated to the rebel fire. On Friday, a private house was destroyed by mortar fire that came from the Ukrainian side. There were no casualties, as the family living there had left the previous day, according to local residents.